I did not expect to get through this one so quickly. Pretty much in a reading slump lately, I surprised myself the further I found myself getting through the book. Set in the offices of Heaven, it follows the lives of two over-achieving angels employed to take care of the miracles side of the business. While it does seem to play things a bit light-heartedly, it somehow manages to shift the stakes to the extreme without batting an eyelid. It’s an addictively warm romantic comedy that leaves you rooting for not only for the disastrously inept, but fated couple they’re looking after on Earth, but the awkward angels as well. 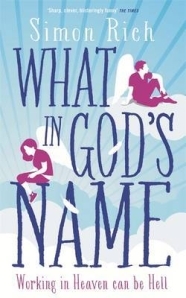 Personifying God, this book doesn’t quite make him out to be the good or the bad guy. Bored, maybe. Addicted to Asian cuisine, yes. But more of a fence sitter, he appears to be when it comes to the operation of Earth. It creates plenty of humorous situations when prodded by some still-idealistic angels. I did have a problem with the ease and frequency at which characters swore though. Swearing can have its place, but this one seemed to be littered with it whenever any character got even a little bit upset. Restraint, people. There are plenty of other softer words that could have been used. Aside from that, I really enjoyed myself. Angels scouring their computer screens, initiating a chain of events so intricate for even the smallest of miracles, it creates a sense of greatness to the world. Plus, it poses the question of who to help when doing so will most likely harm someone else. But the nonchalance on God’s part kept things light. I especially found God’s prophet, Raoul, a tin foil-wearing, sign-waving man, shouting at people things like, “the end is coming,” to be a hoot. But once it began focussing more on the New York couple in the second half, I found myself getting into the relationships, hoping for success, but also laughing at their failed attempts. There’s definitely potential for a rom-com movie here. If you want a fun few hours, pick this one up. I’ve never heard of this book before, but it sounds quite interesting. Great review!